A journey of tabletop role playing games & video games. You wedge yourself sideways through the narrow fissure in the wall, having to stoop so low as to use oil on your body in order to slip across the sharp, jagged rocks. The rest of your crew waits anxiously for you to fulfil your duties. The room you enter is not large, barely big enough even for your small frame as the cylindrical opening holds but a single pedestal. Resting upon the top is the artifact you have been searching for through the Caskaleed Mountains for the past month. It may be the first step to begin closing the dimensional doors the wizard enclave continues to burst open and wreak havoc upon the nation. However, you try to recall what your wizard friend warned you to say before you could safely touch the artifiact….it definitely started with a K.
Artifacts are underrated and underused in role playing games. They are so powerful that they barely ever come into play because after they do, the game generally shifts dramatically. Suddenly the artifact grants the players abilities, changes the conditions of the world, alter a collection of people, use powerful energy, etc. They are often a pinnacle of a campaign, they must be rare and a focal point because of their awesome power. Otherwise, they would just be boring magical items, right? I am curious if a GM can implement artifacts on a more common ground without breaking the game wide open. The pieces would lose a little of their luster because they are more readily available and easier to acquire, but if they were widely unique to the point where no two were alike, then suddenly the artifacts regain much of their attraction. 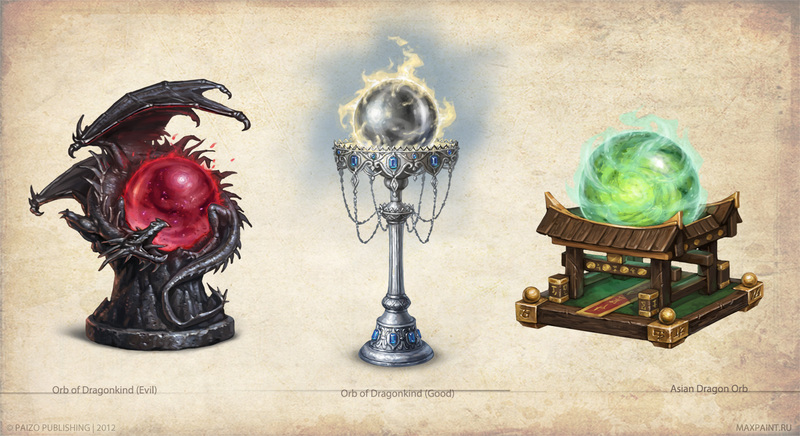 Much like magic items are not entirely commonly found at every bazaar stand, artifacts would be sold by exclusive proprietaries that would require highly sought after official licenses to legally carry them. Naturally this will lead to a more uncivilized business side to artifacts, perhaps counterfeiting would be common and require a new skill to be created to identify them (or simply Appraisal would finally not be worthless to have). Render the world of magic while it’s activated. Artifacts are seldom equal among themselves. They range in varying degrees of power, and so much like magical items of minor or major powers, artifacts can share multiple levels of intensity. This can open up more believable artifacts for common folk who would not be expected to have the mental capacity to wield colossal items. 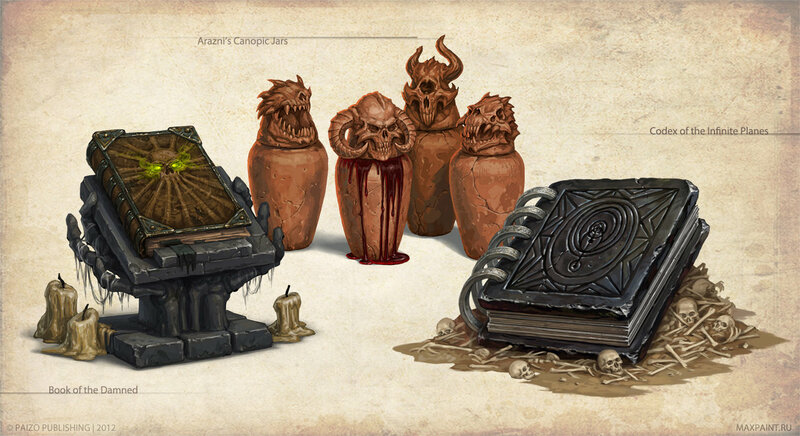 Granted, these would be bordering along your typical magical items, but it would add some uniqueness to the settings. This entire concept could be concentrated to a single country or an isolated continent that is difficult to reach. Naturally the concept is geared more for the high-fantasy settings, and it may not be for everyone. But adding this element to a setting might bring more flavors to the typical scenario that has grown stale. Bring it up to a global scale, and it is set apart from your traditional fantasy settings. Bring it into a modern day setting, and everyone is a varying level of super hero, each with their own sense of purpose in life. One could even make the truly overwhelming artifacts hidden in their world. Perhaps several artifacts combine for a much more powerful one, but each piece is already used by those who truly need it. The megapowerful artifacts could be more along the lines of god-like powers. Perhaps the ultimate point is to never narrow yourself to what has always been. Sometimes ideas work, sometimes they are colossal failures. Know that without applying change of some kind, the feeling of static sinks in along with a monotonous sense of repetition. Don’t be afraid to experiment, especially after consulting with the entire group. Find a new concept to nurture and grow with. Perhaps interest and excitement will extend further than your normal runs. Until next time, lie about your dice roll as much as you can get away with. Thanks for stopping by. Back in the 1980s, my dad acquired an Apple IIgs computer. During that time, in what was a golden decade for the company, Apple games were abundant. The company Babbage’s, which has now evolved into the huge chain, Gamestop, offered computer games much like you see in retail stores across the country today. Beyond computer game stores, I vividly remember a monthly club that got together at a church auditorium that focused exclusively on Apple software. It would allow others who were involved in using the computer to get in touch with other Apple users in the area. The features of the club were really incredible for a young kid like me, though. They had a video game library. You were allowed to take one game for the month. Friends in the club would temporarily donate some of their games for others to try. Then once the mingling portion was done, one individual would do a presentation or tutorial on a particular software program that might be new or a difficult program to understand. It was through this club that I was very fortunate to discover what would be my favorite series of video games of all time, even to this day. There was a company in California called Sierra, Inc., that was founded by Ken and Roberta Williams. The company is now actually owned by Activision Blizzard though they were originally bought out by Vivendi games back in the late 90s around 2000. However, back in the 80s, Sierra was one of the biggest companies in computer video games. Programmers were legendary among gamers like Al Lowe, the creator of Leisure Suit Larry. 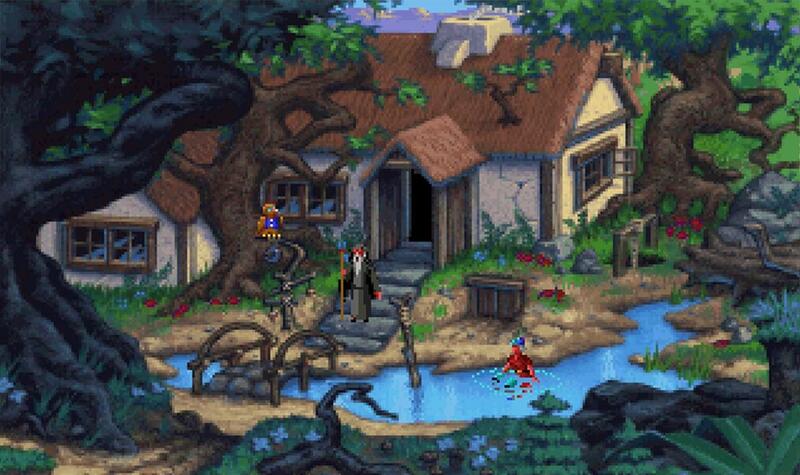 It was with this company that emerged a series of adventure point-and-click games. One of these was King’s Quest. Initially released in 1983, King’s Quest: Quest for the Crown, placed the user in control of Sir Graham, the world of Daventry’s greatest knight, to reclaim three stolen magical items to the monarch. There was basically no violence in the game. In fact, you would be penalized if aggressive actions were taken. It was built on a points system similar to the achievement awards you find in numerous consoles of today. It gave not only a goal to reach for to get a sense of accomplishment, but it also provided a hint if you missed anything along the way as you could beat the game with a less than perfect score. Reaching the highest possible total would provide complete exposure to the game. There were puzzles throughout that were almost in the form of riddles (in fact there is an actual riddle in the middle of the game), and it provided players with a different approach to solving a game by exploration and discovery. 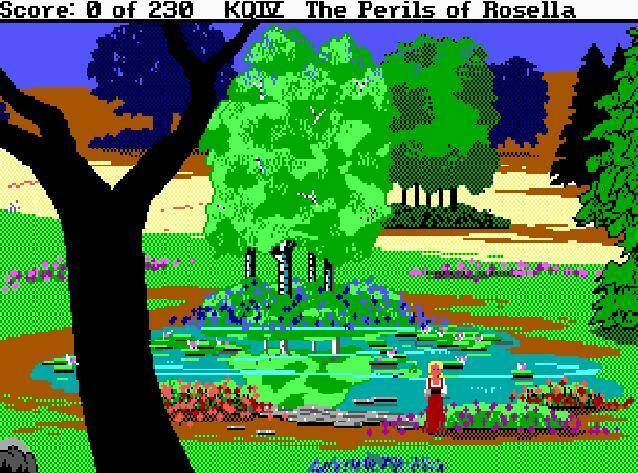 Rich in mythology, legend, and fairytales, the entire King’s Quest series provided children and adults with reflections of age old stories and introductions to new ones in order to complete each obstacle. With the great success of the first installment, seven additions were created over the next few decades although the bulk of the series was done in the first ten years. Each one provided better graphics, more in depth story and puzzles, voiced characters, music, and sound effects alike. 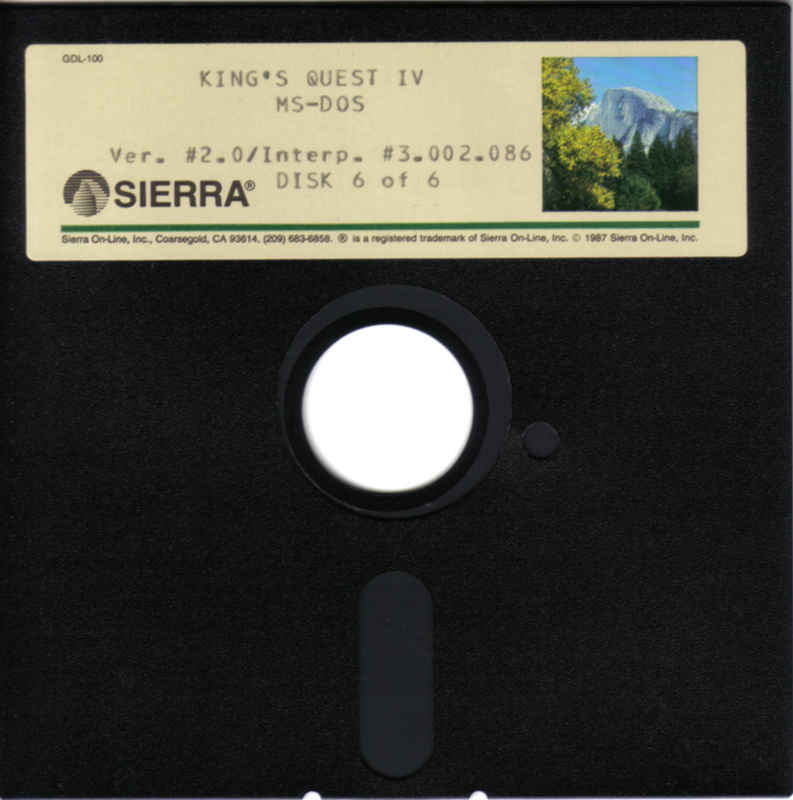 King’s Quest II: Romancing the Throne, a play-on words for the Michael Douglas movie, Romancing the Stone, that came out in 1984 when the game was in development, took up after KQ 1 ended. In this installment, Graham has become King and is looking for a wife. He finds an imprisoned woman in a far off tower while looking through a magic mirror and is whisked away to the land in hopes of rescuing her. Similarly to KQ1, three items have to be acquired in order to complete the game, in this case three keys to unlock a triple door that leads to the tower holding the lady captive. 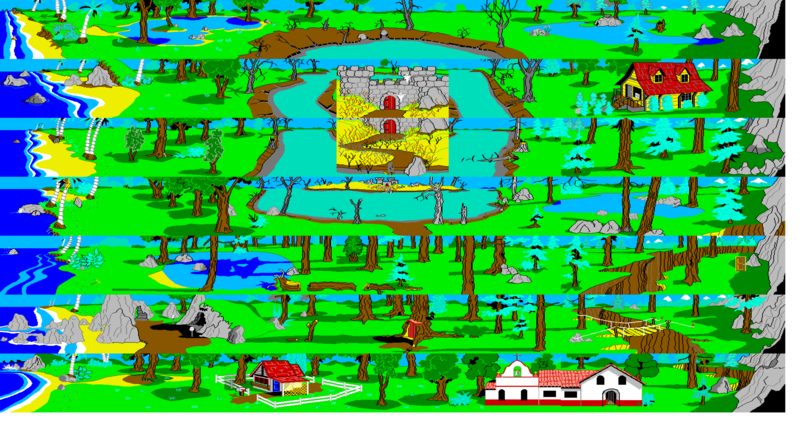 King’s Quest III: To Heir Is Human, offered the unique feature of time keeping as the game ran on its own built-in clock that the player had to keep track of in order to not get caught by the evil wizard while the player snuck out of the house to explore the countryside. Although still enjoyable of a game, it was a bit weaker in plot as the objective simply is to thwart the wizard that has the player kidnapped in his house to do his chores. It offers spellcasting in the form of various ingredient gathering. The fourth installment was King’s Quest IV: The Perils of Rosella, and this was the game that I was handed to first. It was years later before I even played the first two games let along the rest of the series. I fell in love with this game and played it forever. I even had Mom and Dad play the game on their own every now and again. When we discovered something new, we would bring the others into the room and show them what we did. It was an incredible game, but it had a few spots where you struggled to get to a certain point only to realize that you lacked an item from earlier thin the game. These kinds of dead ends happened frequently in adventure games back then, so it was common to have 5 or 6 saved files from various moments in the game. It wasn’t perhaps until the mid to late 90s before I actually beat the game. The “ease” of making a simple game and the greater exposure online to sell the product to customers has led to the reemergence of adventure point-and-click games for the nostalgia and hopefully newcomers. With Kickstarter, Steam, and GoG, these games are finding light once again. There was a span of about 10-15 years when computers were exploding with power in a short amount of time. You remember those days when you bought a computer, and it was obsolete within 6 months because Intel came out with a new processor. During this period, games of the 80s and early 90s were having trouble running at all on more powerful computers. Even today, unless given the proper software, these games don’t run properly. Fortunately through assistance programs like DosBox, these games can live again in our homes. Even more fortunately, since the file sizes of the games are next to nothing compared to today’s games, we are able to install and run these games on our tablets and even some phones. And really the King’s Quest series, along with Quest for Glory, Leisure Suit Larry, and Space Quest series, will provide well over 100 hours of playing time as a complete collection. Since they are simplified, there is no concern of quitting a game for a few weeks and forgetting where you left off. And after Disney purchased LucasArts, the ridiculous decisions of the past to not re-release their games from the 90s is now coming to an end. So the equally challenging collection of adventure games like Grim Fandango and Day of the Tentacle (from Tim Shafer) are getting the green light finally. After years of publishers thinking adventure games were dead (because no one was making them), their popularity is slowly returning (although they will never be as popular as, say, first person shooters). Call it nostalgia, or call it rediscovery. Exposure to these classic games that came about during one of the most exciting decades in computer software history is a warm welcome home to an old friend. Ever since I began playing Dungeons & Dragons back in 1992, I have enjoyed collecting any form of book or literature for just about any roleplaying game I could find. Mostly hardbacks so they looked excellent on the shelf, I confess to having numerous rulebooks I have never even opened let alone played a single session. Collecting books in general has been a hobby of mine for years, but there is something more about going after roleplaying books. Generally if I ever need inspiration on what to write about in next week’s gaming session, I turn to reading one of those off the shelf. If you have noticed them on the shelves of your local gaming store, I encourage any gamer interested in the classic of classics to look at the re-printed premium copies of 1st edition Advanced Dungeons & Dragons core books. Shortly after Gary Gygax passed away, his wife began an ongoing journey to raise an incredible amount of money to resurrect a statue of Gary in his honor up in Geneva, Wisconsin. 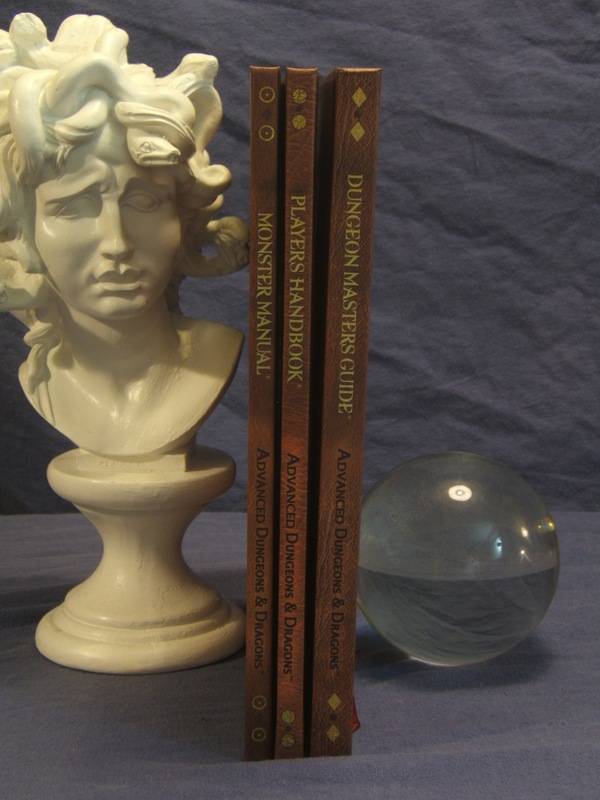 Among the various methods, she approached Wizards of the Coast to toy with the idea of reprinting the original 1st editions on high quality paper. Not surprisingly they obliged and even reprinted a few sourcebooks and bundled a couple of module series into their own books. As a result, gamers are able to leave their original, autographed copies in pristine condition back on the shelf while they proceed to spill Mountain Dew all over the newer versions. There aren’t many roleplaying books I really prefer to leave on the shelf. Off the top of my head, I think my Call of Cthulhu sourcebooks would remain on shelf because most of them are out of print and probably won’t see the light of day on reprints anytime soon. They don’t remain on the shelves forever as I do take them down to browse through from time to time, but in the end, I protect their conditions more than use them. However, having the “premium” copies of AD&D has allowed me to revitalize the classic and introduce the system to many new players. The books are not very thick – perhaps 130-180 in length at most. And the retail cost will feel a bit steep although they sell for considerably less and more affordably on various online retail sites. Unearthed Arcana was released shortly thereafter along with the core books for 2nd edition and the original edition (pre-1st AD&D) of Dungeons & Dragons. These offer not only opportunities for new players who are unfamiliar with D&D, but also veterans to bring the books back to the dinner table to play again. I personally get frustrated when books go out of print because the thieving scavengers will swoop in and resell the books for considerably more than the original retail value. They are in it for a profit from something they did nothing to create only making a quick buck by victimizing would be collectors. Usually reprints of books from 20+ years ago are not economical or financially sound, so companies often look away from the notion of bringing back (or even updating the quality) any former literature. 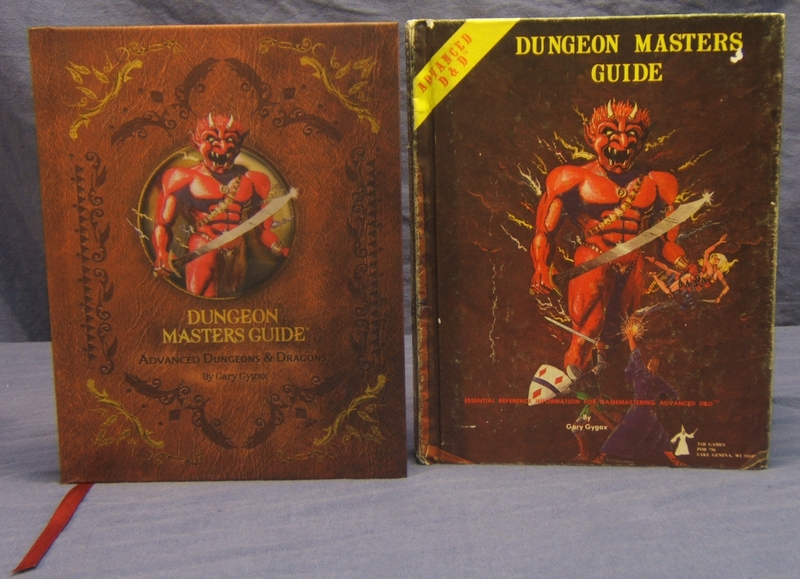 Ever since 3.5 edition came out for Dungeons & Dragons, I have been disheartened by the company on producing new versions of their system so closely together and ignoring or even discontinuing past books after we invest so much (SO MUCH) money into them. All too often we find ourselves rebuying books with enough change to justify the means, but in the end realizing that the two versions are similar enough that we were better off not investing again. Yet if that decision is made, then good luck finding new published material. With their decision to re-release OD&D, 1st, and 2nd editions to the public in higher quality, longer lasting versions, I have considered re-evaluating WotC again. As with any business, they are looking for profit at the end of the day, but releasing copies of other versions that technically compete with their current product, is usually unheard of. The older copies are significantly cheaper, and they are much lighter to chew on than more modern RPGs. (One may argue that older editions of AD&D contained endless charts to refer to, but those were there for the GM’s benefit when ideas needed to be produced on the fly and the creative juices were running dry). The covers are produced the same way Wizards of the Coast produces their most current material. There is a mixture of glossy and matte finished throughout the covers, and the paper is of much heavier weight than the originals. Each page feels semi-glossy. The ink is much bolder and richer (as many of our books are faded from age and a lack of using archival ink). There’s a better feeling of durability in these productions simply because literature material is better now than it was 30+ years ago. These will last for quite some time. Like many people, I often reminisce of the enjoyable moments of my past. Perhaps the most frequent thought is of my younger days of the 1980s when video game consoles were really starting to take a surge through households while arcades were still making millions a year. We probably all had an arcade nearby growing up, usually in a shopping mall. It was when arcades still only cost a quarter a game. While there are arcades still around the country, too many of the machines require upwards of a dollar in order to play a game that may only last a minute if you aren’t the greatest player in the world. Technology in gaming consoles and computers were the reason for making arcades obsolete. There was no reason to drive to an arcade when the arcade was in the living room and didn’t require numerous quarters to play (although the cost of one game these days is considerably higher than what I would pay for one arcade in quarters). Although I have consoles that are either modified to hold thousands of older games, I will still walk into an arcade that holds 70s, 80s and 90s standup cabinets. The question many ask me is why? This is especially with younger generations who knew nothing of arcades or was exclusively exposed to high-rendered, fully immersive games. I could buy a giant joystick platform that is every bit as large as one from the arcades, plug it into a gaming system at home, and it should feel the same, right? Well not necessarily. There’s a bit more to it than just a joystick. First, it’s the environment. The atmosphere. The cornucopia of music and sound effects orchestrating from the room well before you stepped foot inside the arcade. And yet, unlike the effect of playing numerous songs at the same time, there is a level of harmony that resonates throughout because many of the arcades used the same style of MIDI sound system. 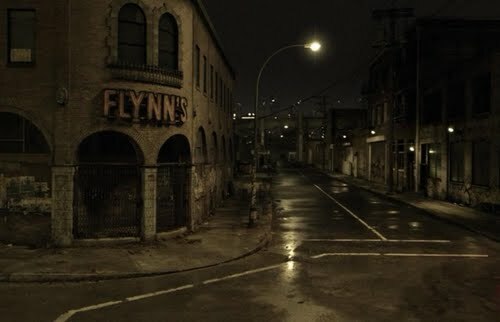 The room was always darker. Usually the rooms were narrow to save money on real estate with only a single row of fluorescent lights that barely illuminated the room. It also complimented the hypnotic glow that came from the brightly lit screens. Despite what experts may say about having too much contrast with illuminating screens and the illumination of the room, there is a reason why the lights go nearly completely off in the movie theaters. The glow from the screens attract our eyes just like, yep, the old cliché of the moth to a flame. Our eyes are attracted first to movement above everything else. Next, bright lights attract us. And if you’re curious, the colors white and yellow attract us after that if you were to place them in order. So turning the lights low is just smart business management to attract people walking by in the mall. Once you are inside, you’re hooked. An overwhelming desire to get whiplash as you look left then right then left again, wanting to play that one….oooh this one first….no this one looks cool. In 15 minutes, you could theoretically have the entire place played through once if you’re fast, yet the draw to select the absolute favorite one is always challenging. Finally, however, the decision is made like maggots in a butcher shop. Even when you put the quarter in, there was the satisfied feeling of anticipating the game, the feel of the ridges from the quarter as it passes into the glowing red coin slot, and the typical sound the game makes letting you know the coin was accepted and not sitting in the coin return. The buttons had little resistance to them – just enough spring to bring the button back to its stationary position. This allowed you to absolutely beat the ever living hell out of them with next to zero chance of breaking the system. That didn’t keep the arcade keeper from yelling at you to not smack the cabinets so hard, but you went right back doing it the second he walked on. The noise was so intense when you are in an arcade that the sound was easily drowned out. Standing up to play a game can only be comparable for younger generations by playing the consoles at Wal-Mart or Gamestop. Our backs and feet grow tired; we long to just sit down for a few and relax. Yet we stand for 5 more minutes because while we play the game, we are lost within its world and locked in to the comradery of the sights and sounds. There are cabinets right up against yours so closely that you can’t see the beautiful artwork displayed on the side panels. I feel I played better, sharper, than I do with a console. If I run out of lives on Super Marior 3 (which you should never), you just hit Start and away you go again with more lives or continues. With an arcade, you are in it for the money. That game is played on hard earned cash, and the longer you manage to play it, the more you stretch that quarter out. Arcades are still out there, both the over-the-top kind with the latest arcades and a slew of those rip-off ticket games, and then there are the classic arcades. I’m seeing a few pop up throughout the country that are no longer based on the coin but on the hourly rental. Coins are infrequently in our pockets compared to 20-30 years ago as more people use credit and debit cards. 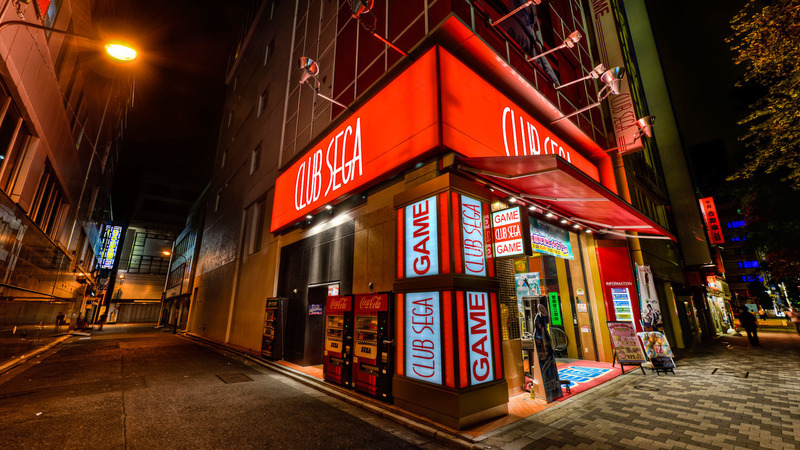 Numerous arcades that offer the classic cabinets are paid for up front in dollar form then granted full and completely free access to any of the games in the place for a set period of time. The owner is banking on the average user to have very little attention span and grow bored of the games by the time he reaches what would have been the amount he paid for in quarters. And from what I have experienced, that frequently is the case. Paying $10 is 40 quarters, which is 40 different times to play. Many kids, especially today, wouldn’t play that many times before getting distracted and wanting to leave. It’s the older players, usually over 30 years old, who give the owner a run for his money. I also miss becoming Gamer Friends temporarily with a complete stranger there. I recall back in 1989 I was playing on one of the greatest multi-player arcades ever built: Teenage Mutant Ninja Turtles. 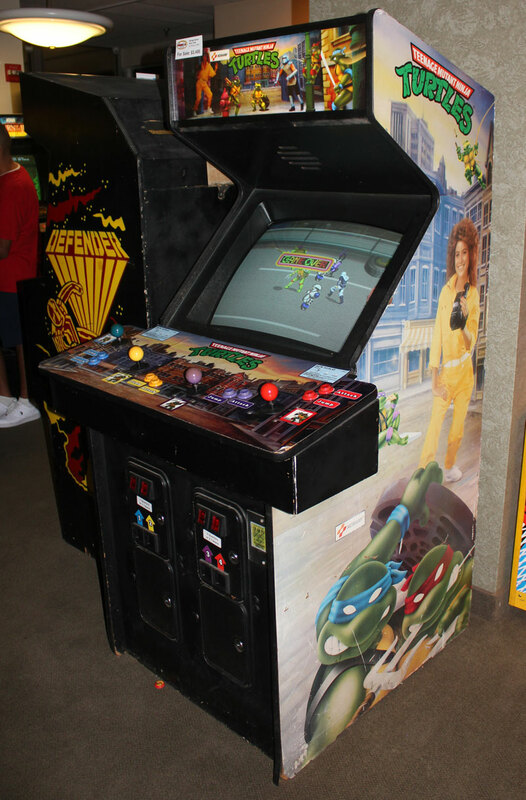 It was a 4 player game offering access to any of the turtles. My dad treated me to $10 worth of quarters, and I decided to stick with that one game the entire time I was there. I will never forget throughout that incredible run in which I beat the game of the number of different kids who would join for a minute or two and then leave to be replaced by one or two others. At one time, all four joysticks were being used. None of us knew each other. We just knew what to do. I remember Dad saying,”Okay, this is the last quarter. Make it count.” I had been fighting Shredder at the time and managed to take him out with barely any health left. But that moment stays with me longer than any game I have played on any console. Although I was around arcades only a handful of times growing up and in front of a console literally thousands of times over the last couple of decades, I still remember the joys I had at the arcade. Being at the arcade also kept Mom from saying I should get out of the house and go play. I’ve experienced quite often that a GM’s highest point of excitement and motivation towards a campaign hits right before and up to the first portion of the beginning. The concept is there, which is always the fuel for motivation though the actual process of fleshing out the campaign often becomes more work than initially had anticipated. Some GMs enjoy fleshing the majority of the world out for months if not more before beginning an epic long, multi-year campaign while others give the world a name and then build it on-the-fly as they go. Whatever the case may be, there are a few key points that can occur before the campaign begins that really can enhance the flavor, increase excitement, and prolong motivation for both players and GMs alike. One idea is for players to play an initiation session that helps their focus on what kind of character they wish to play. I generally make very vanilla characters with seemingly little to no huge distinctions of a particular class or even race. They are generic 0-level characters with perhaps three skills on their sheet with a couple hit points. From here, I either will begin their game as they were children or, at the very latest, into their adolescence years. Most players I have GMed have shown more appeal to playing children variations than anything. I scale things down, bring it on a smaller level. Full-blooded, enraged orcs aren’t attacking them. Instead it’s closer to a garden full of gophers that are threatening to destroy crops. Nonthreateningly threatening is the key so it is the right scale for child characters to handle yet not too dangerous for the need of teens or adult characters. I give them opportunities to choose their class without choosing their class up front. Prior to the battle, I might have a skirmish where the party discovers a torn piece of paper that has strange words, but I leave it open to the table to have a player speak up they want to read it. Generally the person who is more intrigued about the words might very well want to be an educated class like a wizard or cleric. There might be a moment they can be mischievous and need to get into a father’s locked cabinet that might have some tools. Leave it open for someone to either speak up about inspecting the lock or perhaps trying to pry open the door with a lever. I simplify the classes to as elementary as I can present them, and provide subtle moments for the players to act upon. Next, I allow for leniency on various challenges. If someone speaks up and wants to tightrope, I let them, perhaps with a die roll for good luck. I run the game far looser than I would during the campaign because the point is initial development and not actual story progression. The players are free to write down the skill they thought of using at the moment, and later they can reflect this into an actual skill or special ability that suits the rule set that is being used. Of the two or three skills that might be provided by the GM prior to beginning the game, allow for others to use another’s skill if the owner isn’t too wild about it. However, make sure the situation presents itself with that skill before the swapping occurs. Some new players will look at a skill such as lockpicking and think “that sounds awesome!” but then grow bored when they have to check door after door. With that being said, I do throw in hints and foreshadowing of possible future events. They fight a small critter only for it to return years later as a much larger creature with the same battle scars. I provide an opportunity even for the players to mold the beginning of the long-term events. They might mischievously open a sealed door that unleashes a powerful spirit hell-bent to reclaim a body and dominate the country in which the players must strengthen and grow over the coming years before it succeeds. There are a few RPGs that involve children as the characters such as Grimm where the kids have levels of imagination to alter the fairytale world they live in. One could use the concept as inspiration if using another system like Pathfinder. Sometimes this scenario isn’t necessary. The players may already be eager to run a half-dragon half-vampire fighter/mage/thief. The idea really helps those who aren’t familiar with RPGs or are just unsure what character is appealing to them at the moment. 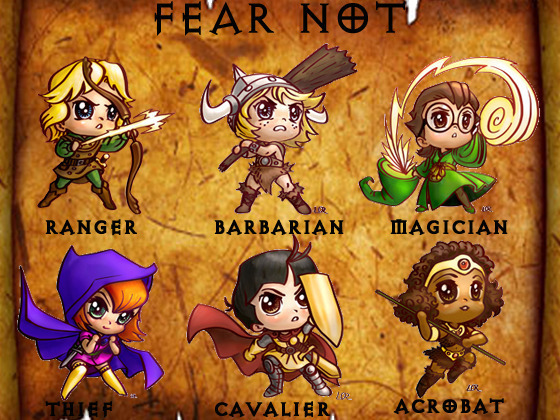 Generally this one-shot adventure can provide the various focal points that each class offers. Although this game should be light and quick-paced, the game can get out of hand easily if players begin over-role playing their characters as children or adolescence. The jokes will come flying in throughout, which is fantastic. However, as a GM be sure to not let the game get out of hand with nothing but ridiculous, time-consuming antics. Use this opportunity to become comfortable with what should be allowed and what needs to be throttled down a bit in order for the game to finish on time. 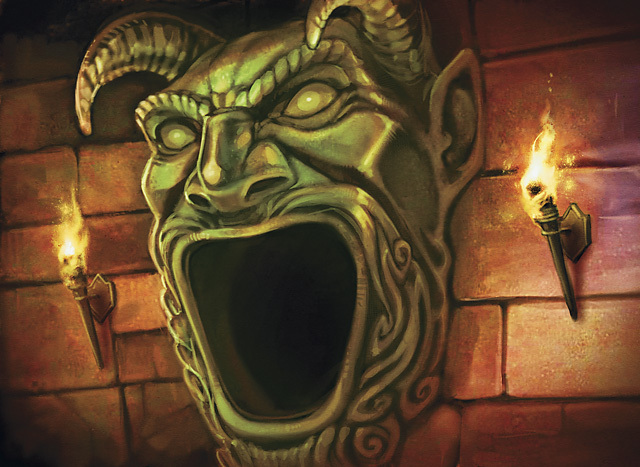 Feel free to leave a cliff hanger at the end of the session to get the players even more excited about the campaign. Perhaps make it catastrophic on a global scale. Also continue to pay attention to the players’ choices in the game. Try to learn their style of play if you haven’t already. Make notes about each player’s preference and try each week following during the campaign to focus on at least one of them. Characters can be made as generic as possible or they can be pre-gen 1st level characters. Players can have two or more at the same time, deciding which one to play as during the introductory session. I have seen some play 3 low hit point characters at once for one-session, picking from the survivors. Whatever the method, consider this alternative to simply handing out blank character sheets and expecting them to know what they want up front. Often GMs will see their players make a character, but then they regret it after the first two levels because either it doesn’t fit the campaign very well or the initial concept was greater than the reality. Playing generic 0-level characters with slight customizations can prevent this from happening because they essentially are taking characters for a “test ride” before purchasing. They may be torn between a monk and a druid in their minds, but after playing the first session almost entirely in a city, they decide the monk is more fun. Consider throwing a clause into the house rules where any character may be substituted for another without experience penalties prior to reaching 3rd level. Although having an initial session may eliminate the need for this clause, it is good to provide one as it really won’t break a campaign that early in the storyline, and it will allow fickle players to be more satisfied. In recent years, as older video games begin to see rejuvenation in popularity, there has been one clever discovery that can really enhance your hunting at flea markets and thrift shops. Back in the mid-1980s when the NES was really exploding on the market, Nintendo’s home office in Japan couldn’t keep up with the demand in the U.S. Up until then, they were rebuilding the cartridges to work on American systems. For a short run, they came up with a simple adapter that fit inside the game cartridge to convert the Japanese version to work on an American NES. This adapter was just a rectangle piece of plastic that allowed for the circuit board of the Japanese version to plug into one side and the American board to plug into the other side. This allowed for the data to transfer over to the output and be read properly. Surprisingly, no one at Nintendo leaked this information out for years, in fact decades. It was only in recent years that the information began surfacing on the Internet of the hidden adapter. The truth was this adapter could be removed from the cartridge and used on most Famicom games, Nintendo Japan’s name for their Nintendo system. The U.S. board that was attached to the adapter was generic and could be used elsewhere. So with the two components, one could hook it onto a Famicom game and be able to play it on their own system. Of course, if the game involved Japanese, it would still be in Japanese. However, many of the heavy-text games like the JRPGs followed a similar pattern in command menus like their converted followers and could be figured out as long as the story wasn’t important. Suddenly the race is on among gaming collectors to find a hidden adapter. 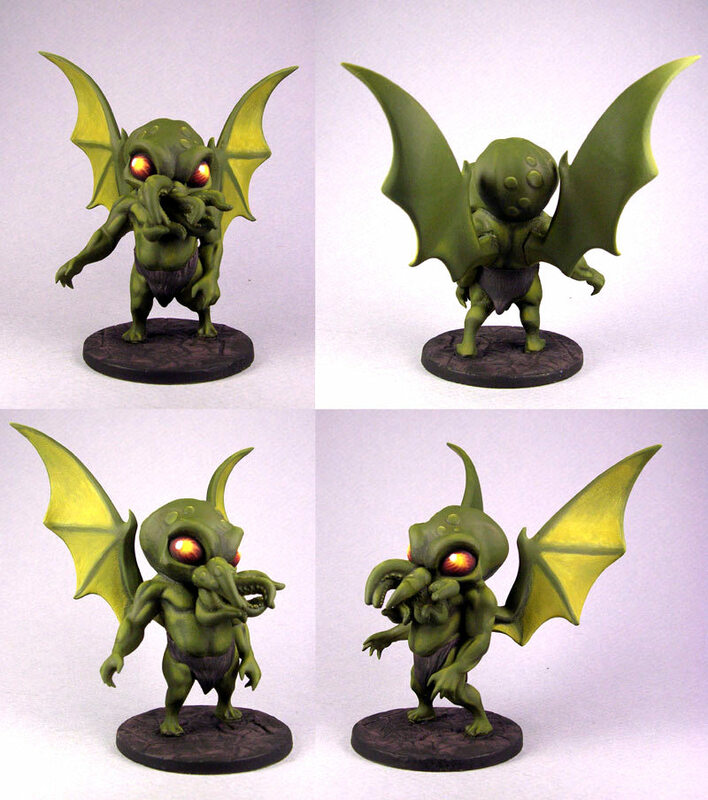 Of course, by now you can simply buy one on eBay, but why would you when you are an expert gaming hunter? There are several ways to discover whether that cartridge for $1.50 in the bargain bin of Goodwill has the adapter or not. What seems to be the most common NES cartridge that contains an adapter is the 1985 release “Gyromite,” a game involving lifting and lowering pistons as you travel your way through a side-scrolling labyrinth. This game was particularly well known for its added feature and introduction of R.O.B., a toy robot accessory that played alongside you taking command of one of the controls. 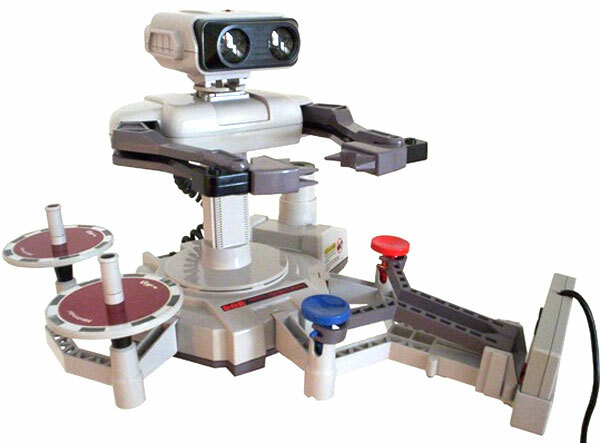 Through the use of gyros, or heavy spinners, the robot would place one on either a large red or blue lever, which in turn would press either the A or B buttons on the controller. Much like the Zapper gun, R.O.B.’s eyes would detect flashes on the screen to activate its motor skills. The first time you come across the cartridge, take a look at the label, which will be your first hint on whether or not it has an adapter tucked away inside. On the label is a small icon depicting R.O.B.’s head. The older copies that had the adapter had a much bluer icon than the later versions, which contained more purple. This is not a guarantee as coloration can change over the last 25 years depending on the environment it was in. Blue will begin fading lighter in the sun over the years, possibly looking more purple or pink. After inspecting the label, try balancing the game on one of your fingers. With the adapter, the center of gravity will be more towards the middle since the hollow case is almost entirely filled with circuit boards. If it’s front heavy, it probably won’t have it. 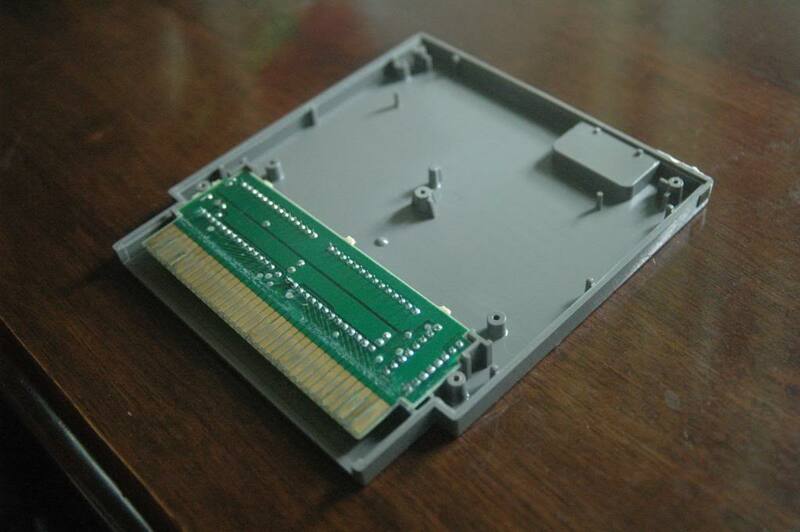 Now turn the cartridge over onto its back to inspect the screw configuration. Does it have 5 or 7 screws? Interesting fact is that the newer NES cartridges had only 3 screws while the Famicom adapter version of Gyromite often had 7, not 5. You will see the extra 2 screws toward the bottom near the output board because those 2 extras are in place to hold the adapter. Furthermore, many of the adapter copies have a tiny flathead screw instead of the star-hex screws. One final clue, albeit tough to spot without sharp eyes, are the connecting pins. There are a few other video games besides Gyromite that contained adapters (keep in mind not every copy of these games had them). These included 1942, Clu Clu Land, Donkey Kong Jr., Duck Hunt, Elevator Action, Excitebike, Golf, Gumshoe, Hogan’s Alley, Mike Tyson’s Punch-Out! !, Pinball, Raid on Bungeling Bay, Rygar, Soccer, Stack Up, Tennis, Urban Champions, Wizards and Warriors, Wrecking Crew. While these are harder to spot, each of the connecting pins should not be symmetrical. There should be a tiny nib on the tips of each either on the left or ride edge of the pin. Later versions will be in the center. For collecting enthusiasts, the adapter is a must although some have modified a Famicom to work in the U.S. It is a personal preference on how dedicated you want to invest into playing games from Japan. Either way, even if you have an adapter already or have no interest in playing games you can’t understand what is said on the screen (unless you are fluent in Japanese), it still is a fun way to kill time while roaming the aisles of a flea market or second hand store with Mom or the wife. Over the weekend, I decided to try one of the pre-loaded retro video game systems that are for sale at various stores like Toys R Us, Wal-mart, and even some Dollar Generals. The ones I have found so far is an Intellivision, Atari 2600, a ColecoVision, and a Sega Genesis system. I found two versions of the latter system, one having about 20 Genesis games while the other has 40. Both of the consoles had additional cheap, knock off games like chess just to make the game total higher for more appeal. 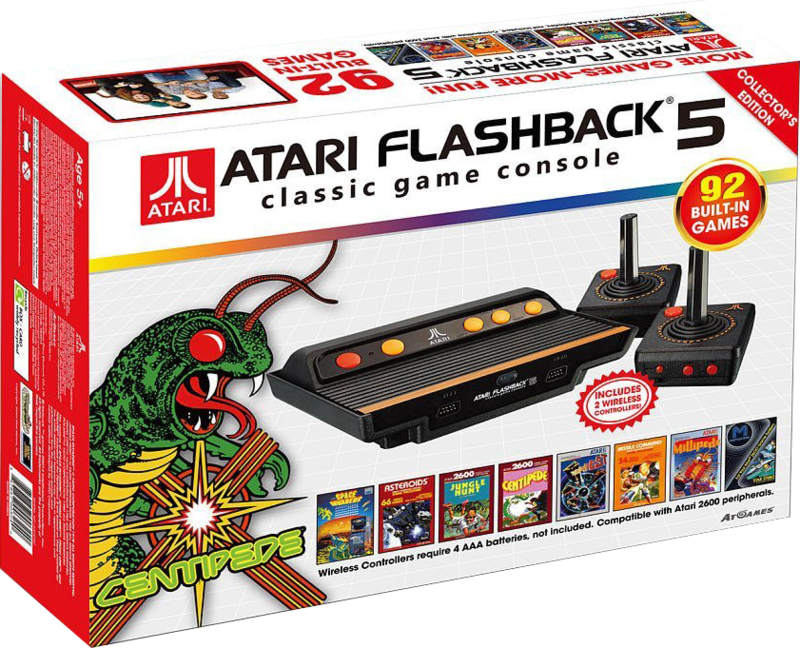 The ColecoVision and Atari systems have nothing but official games and are considerably more loaded since the games were far less in size compared to the 16 bit Genesis. I decided to get the Genesis as it had quite a few games I really enjoyed (more on that later). 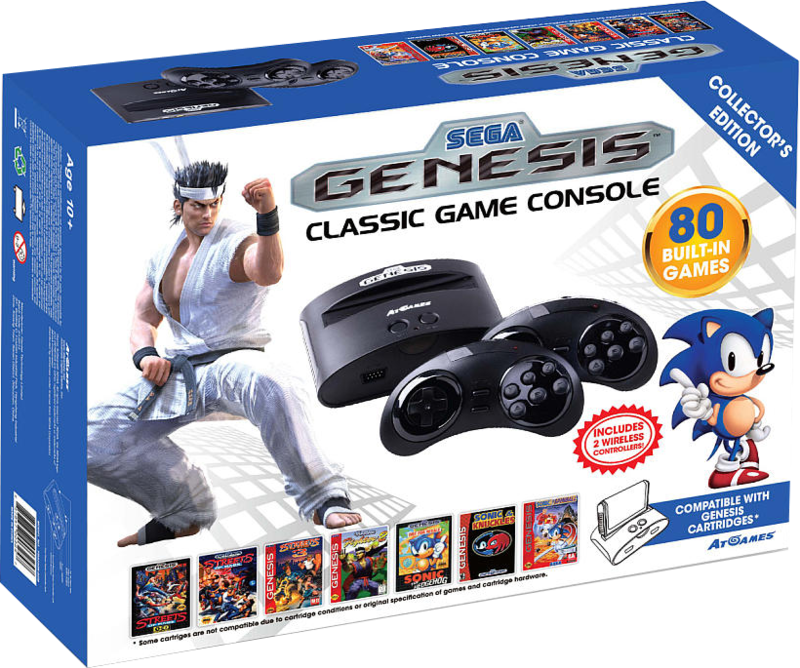 The console is only about ¼ the size of a late model Sega Genesis and comes with a game slot to play cartridges as well. The version I got, the one with more games loaded, comes with two wireless 6-button controllers. 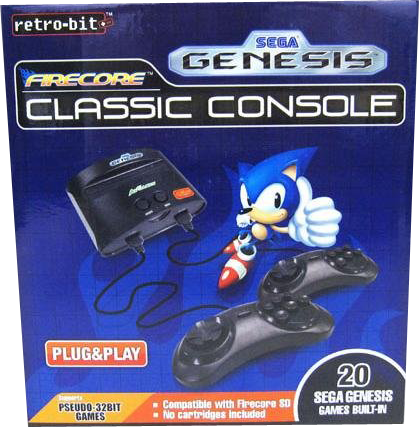 Of course, since this is not an official Sega release, the controllers aren’t quite the same as the original 6-button. The entire system, controllers included, are much lighter and feel cheaper made (because it is). The controllers have a battery chassis on the back as would be expected, but a definitely design flaw is that it requires a screwdriver to open. Both will require two AAA batteries to operate. Fortunately, the console comes with 2 ports for wired controllers. I plugged both my standard 3-button and my 6-button turbo joystick in both ports, and they worked just fine. The A/C power unit is a narrow body, so it can plug in between other plugs unlike the bulky brick the original Sega required to operate. Unfortunately the system just comes with mono audio cables (meaning one yellow and one white, no red), but given the fact most are playing this for cheap nostalgia based upon us playing on small TVs that had 1 built in speaker, it will sound exactly as we remember. There are the two expected buttons on the top, one for power and the other for restart. This is where the provided wireless controllers really show their benefit. Each one has a Menu button built on it to reset the system back to the menu options. If using another form of input device, a manual reset on the console is required. I went through the list of games after powering on the Genesis, trying out a few that I remembered such as Ecco, Sonic, and Comix Zone. Since I haven’t played my original Genesis in years, I couldn’t quite compare the performance value of the system. Some claim that the speed is close but no cigar as the system is emulated, but playing Sonic, I had no real issue with his speed. All other games performed flawlessly without any lag or delay. There were no moments of audio drops or graphic glitches. The system never crashed or locked up. If you were to just bring one regular 3-button controller and the system with the two cables, you could easily fit it in a tablet backpack, it’s that small and light. Most of these loaded systems are running around $45 though online deals could drop it into the 30s. I’m guessing we haven’t seen a pre-loaded Nintendo or Super Nintendo yet because of licensing issues and because they already have the games for sale digitally via their WiiU online store and on 3DS. 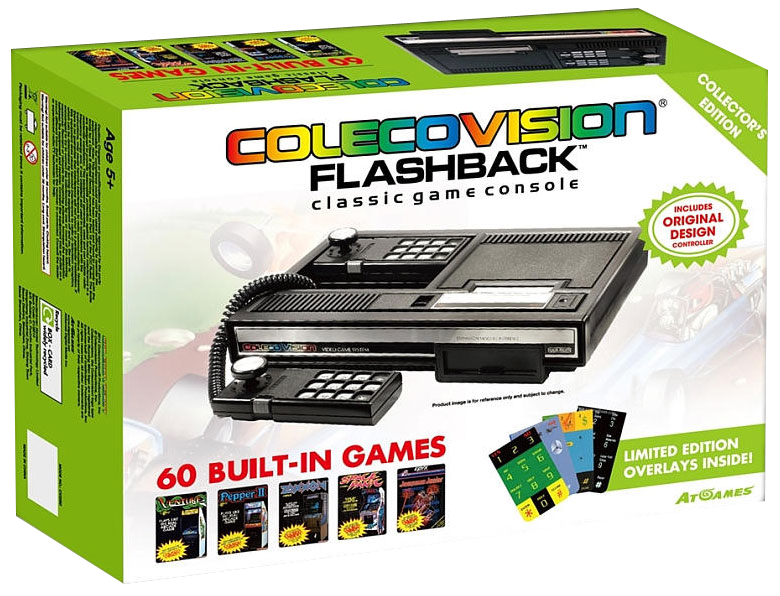 Keep in mind the existing systems on the shelf like Colecovision are extremely cheaply made and may not last very long. Some cartridges won’t work on the Genesis either, though I haven’t found a list yet. However, bang for your buck, these pre-loaders are really an excellent way to get back into retro gaming or introduce classic systems to younger generations. They make for excellent presents for the price, averaging out to about $1.00 per official Genesis game if the system is considered free.